Each PRactical ADvantage Communications student is responsible for knowing what's in the Agency Answer Book, and for using the tutorials to learn how to use Cision and Function Fox. All are requirements for successful completion of the agency experience (COMM 474). The instructors won't "teach" what's shown here, so you need to dig in and master the concepts and skills on your own. You may speak with your instructor or the lab assistant if you need further guidance. Each COMM 474 student needs to know the business policies, functions, and resources of the agency. This book is the guide. Click on the link above to view or download a PDF copy. You will also find a copy in the agency Google Drive and in the lab. The 2019 Answer Book has been revised with a new Policy Manual section. Each PRactical ADvantage Communications student is expected to have working familiarity with the Cision media management platform. Depending on your client's needs, you may need to have intimate knowledge of the Cision resources that identify key influencers, monitor media content and build your client's brand. Please see your Account Executive for the Cision user name, customer ID and password that will be needed for you to access Cision. You should immediately view the Cision tutorials that you will find online at the link below. Complete, correct use of FunctionFox is a COMM 474 requirement. Each student must use this program to keep track of billable and non-billable hours. The student lab assistant will set up individual student password-protected access to FunctionFox. You are responsible for learning how to use the program. Accurate reporting of hours spent on the client campaign factors into your final letter grade in COMM 474. Function Fox tutorials can be accessed at the links shown below. In 2012, one of our student teams developed a user manual and set of 14 video tutorials for use of FunctionFox/ TimeFox. In 2017, FunctionFox/ TimeFox migrated to a new user interface, so the student manual and videos are somewhat outdated. However, the concepts are still relevant. And since they were created with PR AD COMM in mind, we're going to maintain the links to these materials. Our thanks go to Account Executive Tiffany Quach and team members Kris Peterson, Brittney Rodriguez, and BrynnYardley. Please be aware that these materials represent a significant investment of time by our students. Please respect that investment and do not duplicate or share these materials for commercial purposes without the permission of PRactical ADvantage Communications. Please contact Dr. Doug Swanson. 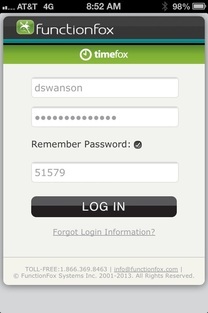 Check out the new FunctionFox app for iPhone, available through the App Store.